One of the practices that is fairly consistent across different kinds of druidry today is a druid’s crane bag. Traditionally, a crane bag was made from the skin of a crane, and served as a spiritual working tool for the druid. 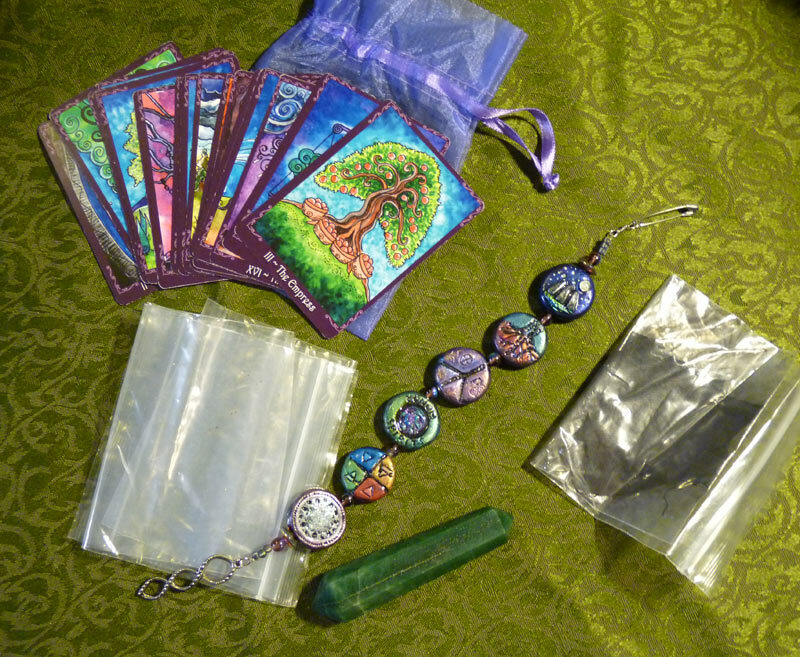 Today, druids of many different paths create and carry such bags and use them for a multitude of purposes. When I wanted to create a crane bag when I first became a druid seven years ago, I didn’t find a lot of clear information out there about how to go about it. I did find some general suggestions from the AODA (Druid’s Crane Bag). A lot of what I learned in books and from talking to people wasn’t really tips but rather “do what you think is best for you.” And while that philosophy is very much in the spirit of druidry, its also not all that helpful to someone getting going on their own crane bag if they are just starting out. Over the years, however, I have worked hard on my crane bag and I’m very pleased with how it has evolved (and where it continues to go). So in this blog post, I’ll walk through some principles that I used to create my crane bag, and photograph of most of what’s in the bag and how I use it. I hope that this post will inspire others who are working on their crane bags! 1. Purchased vs. Used vs. Handmade. I’ve blogged a lot on sustainability and buying things on this blog before, and I want to start by reminding druids that sustainability should be first on our minds. This means to think about sustainability when you are getting the bag itself as well as acquiring/finding/making stuff to put into your bag. Just about everything that I have in my bag is either handmade, a gift, or found used. For the bag itself, I suggest, if at all possible, that you either make your own crane bag or alter an existing bag (which is what I’ve done). If you are going to buy new, buy it from a local artist, rather than than large scale commercial enterprise. The first bag I made was from used linen scraps left over from my robes. I’ve never been much of a seamstress, so while it was a good attempt and looked really cool, the design ended up not so functional and wasn’t well thought out. I’ve since retired that bag for other purposes. The second bag, and my current crane bag, was a wonderful denim bag with many pockets that I found at a thrift store. 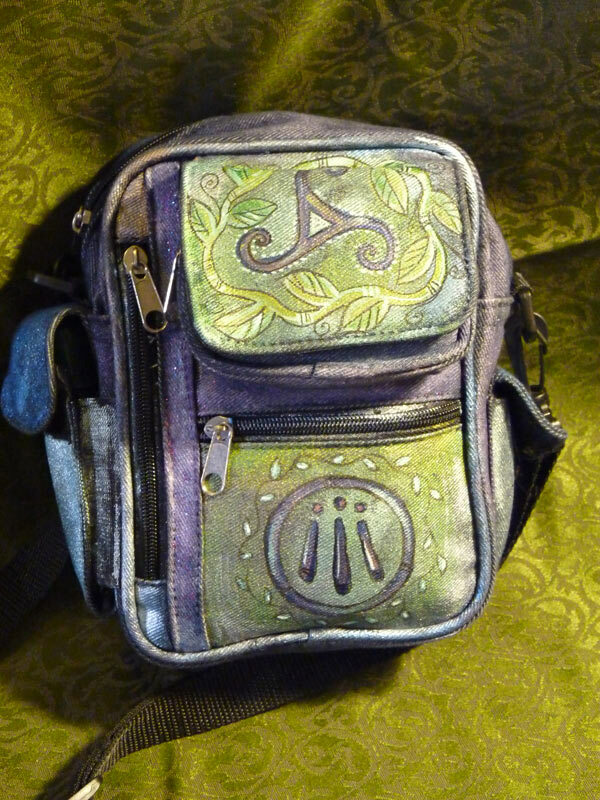 After purchasing the bag, I decorated it with some shimmery fabric paints (painting a triskele, vines, and an awen) and really personalized it. I should also mention here that if you are going to be using purchased or used items for magical work, its probably not a bad idea to cleanse them first. I usually do a simple sunlight/moonlight cleansing or use some sage or other incense especially prepared for that purpose. 2. Size matters. Some of my fellow druids have crane bags so large that they can fit all of their working tools in them (including a wand, etc). The problem with a really large crane bag, however, is that its not very portable. One of the things I’ve worked hard to do with my own crane bag is to get a small, portable bag, one that I would not mind carrying along on a long hike or taking on a trip. Something that is so easy to grab and go, it doesn’t require any thought. But I still wanted it large enough and versatile enough to carry what I need. All of the stuff in the photos below fits in my little crane bag that is 7″ high, 4.5″ thick, and 5″ wide. I started working on my crane bag quite a few years ago–but because I wanted to keep it small and portable, its taken me a long time to get everything I wanted at the right size. 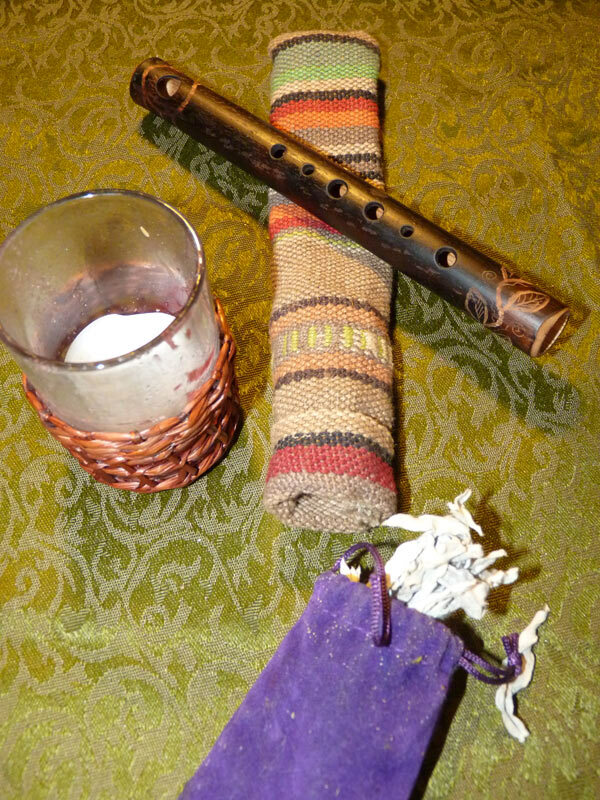 Over time, however, I’ve collected miniature versions of everything I wanted in it–such as the small candle holder, a 7″ bamboo flute that fits in the bag, plus a tiny bag of white sage I gathered while in North Dakota (which is great for offerings or cleansing). The bamboo flute is worth talking a bit about here. I work a lot with music in my spiritual work, and I always like to have instruments available to me. I have a number of larger flutes from a flutemaker, and I actually had him make my 7″ bamboo flute to fit in the bag. He told me after he made it that its the smallest flute he made, but it plays wonderfully and its just the right size. To personalize it, I also carved it with ogham and vines. 3. Flexibility and pragmatism. One of the things I really like about my current crane bag is that, for its size, it has a ton of pockets. Six different areas hold things, and if I’m on a hike, I can also hang a water bottle from it, attach it to my belt, and even slip my phone and keys into it (rather than carrying a second bag, which nobody wants to do when hiking). One of the other things I tried to do was have things in the bag, especially the pragmatic stuff, that have multiple uses. 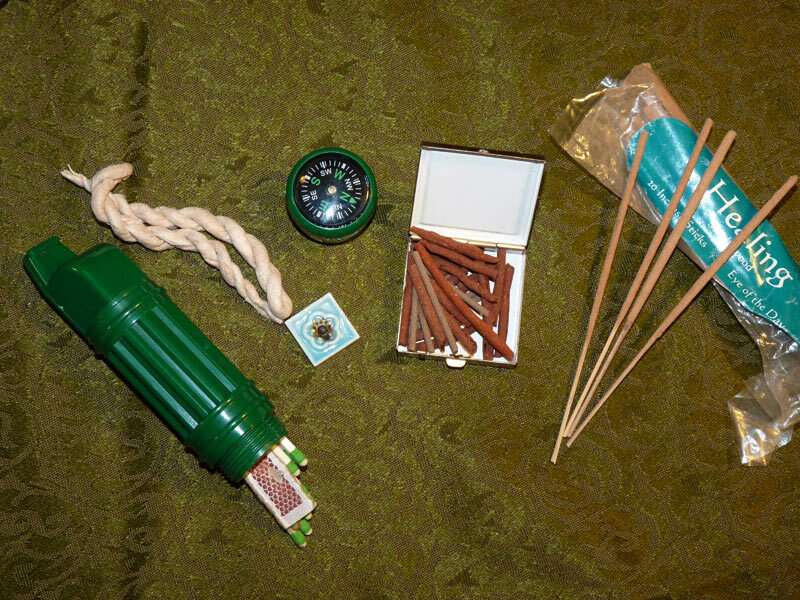 So the waterproof match holder you’ll see in a later photo also has a whistle, a mirror, and a compass on it (you can find stuff like this in the survival/camping section of a sporting goods store). I also was given a multi-tool for Yule one year; its been great because it has a knife and flash light (which comes in handy for night rituals). And its always a good idea to have some tools available when you will be out an about. 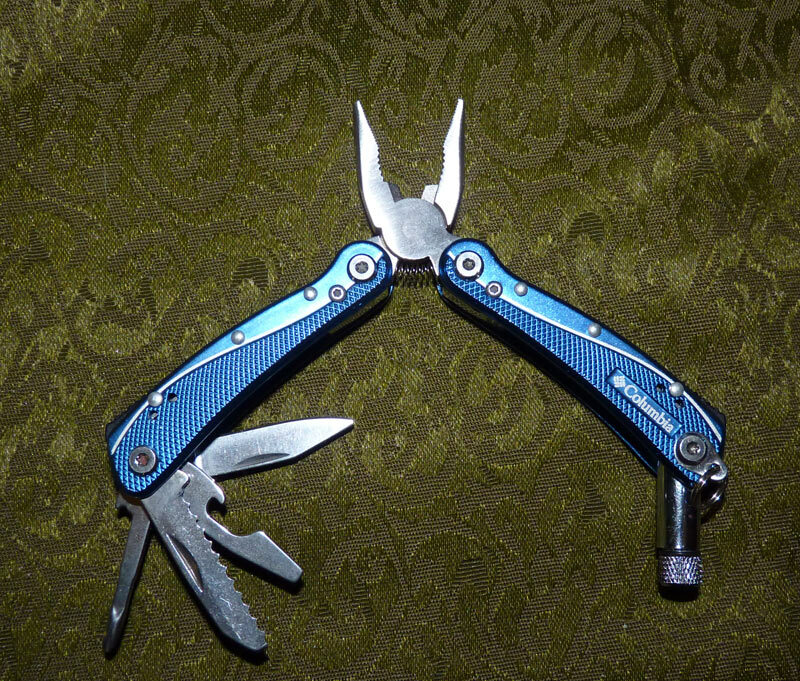 Small multi-tool with flashlight, saw, pliers, knife, etc. 4. Personalization. I do think its important that you personalize your crane bag–especially if you are starting with something you haven’t made. In my bag, I used simple shimmery fabric paints, and it worked well. You should think about things that speak to you–symbols, colors, etc. I used to have things hanging off the bag (beads and shells and such) but they just weren’t pragmatic for frequent use, especially when tromping through brush. So I took them off and left the paint. 5. Ritual in a bag. One way the crane bag was described to me was that its a “ritual in a bag.” And you’ll see that some of the things I have in my crane bag are ritualistic in nature–I have several types of incense, a very small candle holder and candle, and an empty vial for water collecting (not pictured). But if I’m going off in the woods to do a ritual, I prefer to use mostly what I find there, so I don’t carry representations of all of the elements. In the bag as another working tool, I also have a stone that was given to me by a friend and fellow druid. For my own handmade incense (in the little box below) I found an old pill box and I use that to keep it from getting crushed. I use different kinds of incenses for different purposes, so I like to keep more than one kind with me (in fact, I have four kinds in my crane bag currently). 6. Divination systems. One of the very traditional uses of a crane bag were to carry around a druid’s divination system. In the interests of keeping things light, I carry around a majors-only copy of my tarot of trees. 6. Other personal working items. In addition to ritualistic items, I have other items that are worth mentioning. 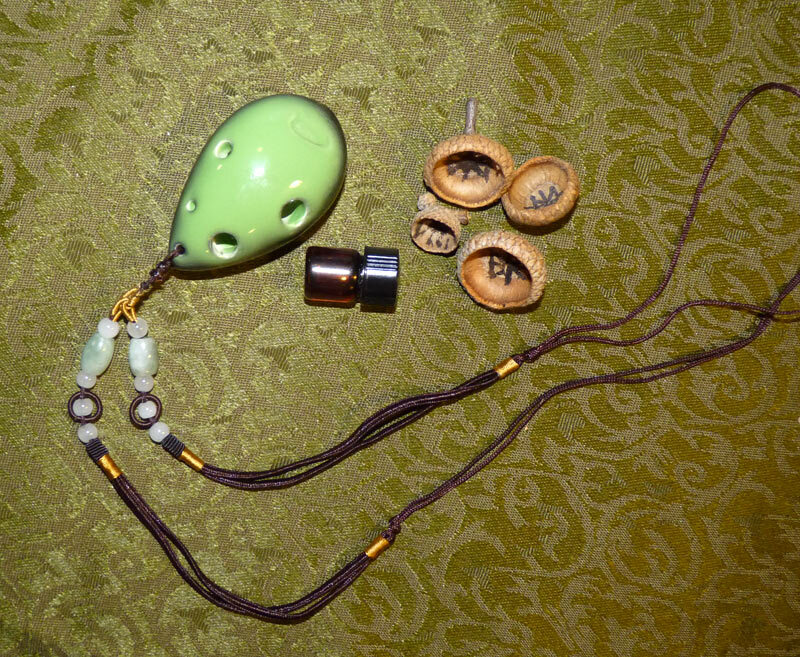 Two musical instruments (the flute from above) and the ocarnia (its a pendant-style ocarina). Some acorn caps, and a tiny vial of magickal oil. I also always carry a few baggies with me (for trash, for picking up interesting stones, etc). 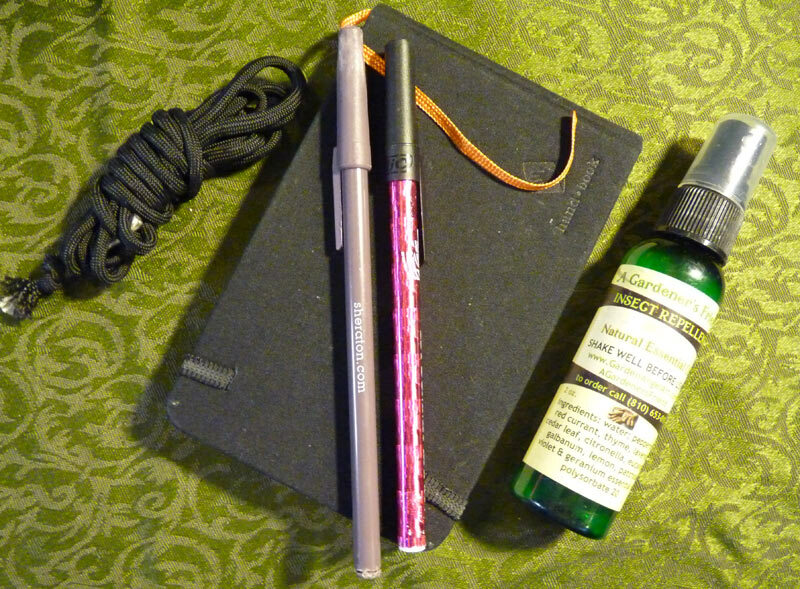 This next photo also shows my small journal and two pens (in case one stops working). I wouldn’t go anywhere without a journal! 6. A few survival items. Because I take my bag when I go on hikes, etc, I also do have a few survival items. In the photos above you’ll see matches (which is also obviously good for lighting incense), a compass, char cloth (which is used to catch a spark for starting fires–I still need to add flint/steel to my bag to go with the char cloth), and paracord (which can be taken apart and used for shelter building, fishing, etc). And let’s not forget some natural, essential-oil based bug spray, which is always super helpful in August when the mosquitoes want to eat you for dinner. I really want to stress in closing that portability and functionality seemed to me to be the biggest successes of this crane bag. I can easily take it where I want to go, take it with me into ritual circles. It has everything that I might need, and its not too heavy or bulky to be an issue. I take it on all of my trips, because you never know when you’ll be somewhere and you’ll need it! Good post! I like being able to peek into your crane bag and see what you have in there! Please do! I’d love to see what others have in their crane bags! I had read your post before, but I had to look it up again since I will be working on my crane bag soon. I have a small backpack type bag that I have had for about 10 years that I think will be perfect. Thanks for the post. I really appreciate your explanation. I am going to try to embroider it appropriately. It’s been years since I’ve done any sewing, but what could be better than working on a crane bag. It’s a new year and “It’s Time”. The Romans in their Latin alphabet had no “U” so that they would write (the tree worshiping folks) DrUid(s) as DrVid(s). To me it is compelling that the word is a derivation of the Slavic word for WOOD or TREE == DRVO or DREVO. For more see www.jandacek.com Also consider that south-east of the POLES (Polyanye) (Field Dwellers) lived the DREVLYANYE (Forest Dwellers). Thus the DRUIDS-DRVIDS-DRVOids are “The WOODIES” in Slavic. Thank you! Being a Druid in South Africa’s not the easiest task, we’re pretty much isolated here, so all the help and advice from this site is definitely appreciated. I would suggest contacting OBOD. They may have some groups there! This is one of the best posts I’ve seen on making a Crane Bag. I’m starting to make one for my ovate journal. I’m surprised by how little information is out there on other folks process. Thank you so much for sharing this! Very interesting post! I love your mnemonic prayer beads. Have you ever thought of making some to sell, say on Etsy? Thank you :). I haven’t considered selling them–I think that these beads are a very personal thing :). Thanks for the comment! Beautifil crane bag. I love your mnemonic bead. They look very intricate. Have you done a post on theae at all?